I've just started on the heel of the second Opal Royal sock. Still have about an inch of ribbing to do on the first sock. I'm going to try a rib cast off that I read about on the Socks 2 by 2 CD. It looks a lot easier than the sewing needle bind off I've used on my other pairs. If you're interested the CD is available from Needletrax and for a limited time you can get free shipping on it. My Socks 2 by 2 CD arrived today! Haven't had a chance to look at it just yet as I've been busy learning how to add comments code to my blog template. Still working on the Opal Royal socks. Got a bit more done on the ribbing of sock one at lunchtime. C.S.I is on later followed by Boomtown so I plan to finish it during them. 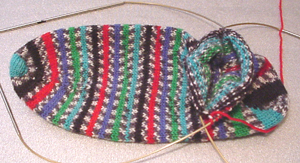 The toe of the second sock is already done. The plan is to finish the pair by the weekend so that I can start on a new Opal yarn (number 207) on Monday. I have to go to London for a couple of days for a course - have to catch a 6.50am train on Monday! - and hope I can get some major knitting done on the train. The Regia socks are going to be bed socks I think so they've sort of gone onto the back burner for a while. I plan to just work on them a little at a time. Just have the cuffs to do on both of them so it won't be that long before they're finished. The next non-sock project will be a cardigan - either one from my Rowan Big Wool book or the short cardigan from the Hip to Knit book in some nice silk/wool mix yarn that I bought from Art Fibers in San Francisco last year. I also have some great kettle dyed yarn that I won on eBay from this seller. It's great and was pretty cheap. I don't know what's been up with Blogger the last couple of days but I've had real problems posting and trying to delete posts. In an effort to post yesterday I posted via email but that didn't show up until today. Then I tried to delete it and it just wouldn't go. Apologies if the blog looks a little strange after this. All of my sock yarn auctions are now on eBay. Creating my first auction took a couple of hours but the last two were a lot easier because I had the text etc. done already. Of course I've still been ordering even more sock yarn from Martina in Germany so I don't think these auctions will help much in reducing my stash! I've had a few inquires about where to get sock yarn if you live in the UK. As I've previously written, I buy my sock yarn from a very nice lady called Martina who runs a yarn business in Germany. She sells many sock yarns via her email list Opal Source - this list is only for people who reside outside of the United States and Canada. This is because of distribution rules relating to the sale of Opal sock yarn. You can join the list here. Once you're a member go along to the "Files" section of the Opal Source group and you'll be able to see the various yarns she carries and read how to order. I do warn you though that you might find yourself ordering too much as I do! Don't worry if you live in the US and Canada because theres a special email group here. but I've found Martina to be a lot cheaper. You can also start a box with her and fill it with interesting yarns as they come along - new ones are released each month or so - and just pay once the box is full. This is quite an economical way of buying, but you can also buy as little as you like. Martina also has a website. Wow! Look at the beautiful knitted bags here. I'm knitting these on 2.5mm needes. Since these were photographed the Opal Royal one is ready for the ribbing to be worked. 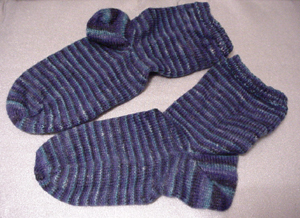 These are the second pair of socks that I knitted. I had thought that the yarn was a variegated shade but it's actually stripes. I have several more balls from this line and am looking forward to knitting them. We bought a tumble dryer yesterday! I feel a bit strange getting excited over such a domestic item but it's been really freeing for us. "Wow! Now we can wash clothes whenever we like!" Ah it's the little things. I washed the Socka 9059 socks for the first time last night and dried them in the dryer. I was a bit nervous because I'd read that Socka socks can shrink a little when washed but they're fine and now really soft. The Opal Royal yarn is very nice. I'm about half way through the foot of the first one. 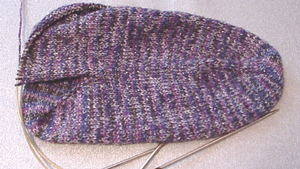 I was going to knit both socks at the same time but have left the toe of one on a stitch holder. Perhaps it's my technique but I find socks on two needles a little unwieldy. Despite that I've bought Sheron Goldin's Socks 2 by 2 CD from Needletrax. Hopefully it'll show me what I'm doing wrong! This blog is one year old today! I started it after being inspired and enthralled by blogs like Chic Knits. There weren't many craft blogs back then but now there are more than I can read! Cast on a pair of socks in a purple Opal Royal Colourway during lunch today. One of my colleagues asked what I was knitting and when she heard that it was socks exclaimed "Marie, why are you knitting socks?!" as if I'd said I was knitting a building or something! I answered, "Because I can". I know that I don't have to knit to socks, like most of the things I create I could just buy them in shops but they'd never be the same as ones I've created myself. Crafting allows me to choose exactly what I'd like instead of having to settle for something that's second best. Plus nothing beats the high of being able to wear something that you've made or give to a friend as a present. I feel such a sense of accomplishment when I finish something. In my job as a radio journalist I work on intangible things like live interviews and discussions that disappear into the ether once the show's done. When I make a necklace or sew a skirt it's a completely different feeling. I decided to photograph the yarn in our hotel room before packing it all up. Just as well because it's now crammed into storage tubs in my craft room at home! 1- Laika by Bouton d'Or. Worsted weight yarn with twist. Two balls of bright red, two of deep red and one of black. 2 - Phildar Chunky Chenille in black and wine. 4 & 5 - Anny Blatt Angora Super - 70% Angora 30% Wool. Two balls in black, one in purple, one in purply blue and two in a variegated lavender. 8 - Phildar Sunset - a glittery yarn, two balls of Azure a sea green colour. 9 - Phildar Kheops. Beautiful blue green eyelash and wool. Bought two balls of this wonderful fluttery stuff. 10 - Alpaca - 50g of Plassard brand in purple, 50g from La Droguerie in wine. I'm back home now and um... well I can't buy any more yarn for a very long time! You see not only did I buy yarn in Paris but also in John Lewis in London - stocked up on Noro Kureyon for felted Fuzzy Feet and bags, bought Rowan Big Wool book, Debbie Bliss Noro 2 book and three skeins of Noro Iro - but when I came home there were parcels at the Post Office of sock yarn from Martina in Germany and some wonderful kettle dyed handspun yarn from Uruguay that I bought on eBay. So much yarn in fact that I've had to reorganise the storage in my craft room! Plus I've weeded out another five skeins of sock yarn for auction. It was difficult because the yarn incudes some wonderful Opal and Socka jacquards but I really don't think I'll ever knit them. I'll post images of some of my new yarn soon. Bonjour! I'm blogging from a Parisian cyber cafe! Did you know that they use different computer keyboards in France? Neither did I, fortunately they have a few Querty keyboards here too. I'm very tired because my unfit body is just not used to the amount of walking that we've done over the last few days. We've visited La Droguerie and the yarn selection of Bon Marche. Those trips were exhausting because the French have a certain way of doing things and it certainly isn't the quickest or most convenient way! After all of the queuing and grumbling I came away with some alpaca, beautiful angora for a pale lavender scarf - a little sedate for my tastes normally but the yarn is just wonderful - some wonderful greeny blue fluttery stuff to use as a highlight yarn, chunky chenille in black and wine and a chunky variegated multi-twist wool for a scarf. In fact most of the stuff above will be used for scarves except for a pink eyelash that I hope to use in the cuffs of my Fuzzy Feet. I would have used the fluttery yarn except that it's part wool and would have felted. Also saw two exhibitions at the Textiles Museum - One was a look back at the fashion of the 1960's and the other a display of some of Jackie Kennedy's clothes and items. Two different views of the same period - one wild, one reserved. Both were interesting though. Some of the mad sixties stuff can't have been comfortable to wear though. Andy has been in Jazz heaven shopping in some of the many CD stores while I've become a big fan of L'Occitane - they sell wonderful soaps and creams. Their hand cream with shea butter is particularly good so I'm going to buy a few tubes before we leave. They do have branches in the UK, although none in Wales, but the products are slightly more expensive there. Knitting on the road - the Regia socks are progressing slowly. I've got them onto one set of needles but I do feel as though I'm fighting an octopus at times with needles everywhere. In fact I'm not sure how safe those needles are sometimes...I'm not very keen on the colour of these socks, in fact I might have a rest from knitting socks for a while after these are finished. Ah, I've just remembered that a parcel from Martina is sitting waiting for me at the Post Office at home, so I'm not sure how long that reserve will last. Well perhaps I could just knit the socks during my lunch breaks and knit the cardis etc. at home. Why not visit Fluffa! for more French blogging? Less than 24 hours before we go to Paris!!!! I've found addresses for loads of yarn stores there but I don't know how many I'll be able to visit. Most are Anny Blatt - and no that pattern book still hasn't arrived! - or Phildar boutiques so I won't need to see all of them. I've found one online that does mail order worldwide so when the pattern book does arrive I can get hold of yarn. There are already many pictures of fuzzyfeet on Kate's site both felted and non-felted. Quite a few have eyelash cuffs ala Bonne Marie and look very cool! I think I'll see if I can find a nice multicolour eyelash on our trip. I have some plain eyelash yarns and some fabulous Fluff from my tea swap with Clara but I don't want to use the Fluff on them. Socks - I'm now on the cuff of the second blue sock. The pattern on these is a stripe in subtly changing shades of blue. While they look great they haven't been as interesting to knit as the Opal Mexicos were, anyway they're nearly done! I'll be taking Regia Jacquard socks to knit over the trip. I'm going to try and knit the two consecutively but on two pairs of circular needles. Just can't understand how you can start them from the toe at the same same. I just got my needles all mixed up when I tried. I expect the best thing to do is work the toe increases first but separately. Once both toes are done it should be easy enough to slip one of them onto the other's pair of circs. A wonderful skein of Cherry Tree Hill sport weight sock yarn arrived today. I've already wound it into a ball and created a pattern from The Sole Solution. I want to take it with me on the trip but there's no way I'm going to finish the Regia pair in less than a week is there? I've sorted out ten 100g balls of Opal and Socka yarns to auction on eBay. I had sorted out more but then changed my mind! Most of these are are jacquards in browny shades, blue shades, greens. Think I might auction them as two lots of five. I'll post a link once they're on eBay the week after next. This blog will be one year old on February 18th! I'm planning a few additions to the site around that date. I don't know yet if I'm too late in signing up but since I read on Kate's site that there's no deadline for completing the FuzzyFeet I've decided that I can knit some too! I'm planning to use some Noro Kureyon from my stash but I also have some Lopi in there too. I might have a go at a few pairs. I won't be able to start knitting until after Paris - hopefully some more 7mm needles will have arrived in the mail by then. Socks - I'm halfway through turning the heel but am planning to start finishing my raglan cardi tomorrow night. Should be able to finish the heel in my lunch break tomorrow. Not had a great few days. My bad throat from last week turned into an awful dry cough which kept me up all of Sunday night. I didn't get one wink of sleep so had to call in sick. Working on a news show when you can't keep your eyes open is not a good idea. I was so tired Monday that I couldn't even bring myself to knit until the evening. Managed to sleep last night but was still a bit dozy while in work today. I've finished the first blue sock, which is quite a subtle variegated ripple design, and am almost at the heel of the second. I should be able to wear them in Paris but am not sure about finishing the raglan cardi. Perhaps I could get it done on Saturday but I have to pack then too. I've been looking through some of my sock yarn and there are quite a few balls that I don't think I'll ever knit. 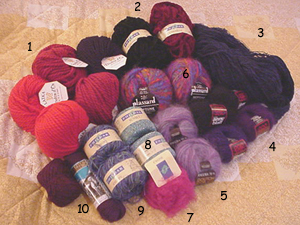 They're all Opal and Socka yarn and I think that I'll auction them on eBay. I'll post a link here to the auctions when they're up. I expect that I'll leave them until after we get back from our holiday.